or a Godless Pagan Icon? Christian Symbol or Furry Pagan Idol? It’s Easter again. Time for young children to be forced against their will by their parents to put on uncomfortable tight-fitting new Easter clothes so they can be exploited by picture-snapping, cheek-pinching relatives. Then it’s off to Church where suffering tykes have to endure a lengthy and boring Easter Service that they can’t possibly hope to understand. The only thing that brings them comfort and makes the day worth it is the traditional hunt for colorfully painted Easter eggs left by Santa Claus’s estranged cousin: the Easter Bunny. The Easter Bunny is so thoroughly mixed into Easter traditions that he often upstages the main focus of the holiday namely Jesus Christ Himself. Jesus had to be crucified, buried, and resurrected in order to qualify for a second holiday. The Easter Bunny did not have to go through such ordeals and yet he gets equal if not top billing on Easter. Due to the bunny’s traditional presence on Easter, some feel he is too Christian of a symbol to use in certain secular situations particularly in government. A few years ago, the city council of St. Paul, Minnesota, felt it necessary to remove Easter Bunny decorations from its premises lest someone not of the Christian faith become offended by the sight of a toy bunny with a basket of fake Easter eggs. aster Bunny but for different reasons. To them the Easter Bunny is just a bit of leftover godless pagan idolatry. How did that wascally Easter Bunny worm his way into a holiday that seemingly has nothing to do with him? The rabbit and his close cousin, the hare, have long been regarded as the heralds of spring in ancient cultures throughout many parts of the world. They were seen as symbols of Spring’s promise of new life and fertility. The Germans in the 16th Century incorporated the old pagan view of the rabbit/hare into a slightly modified new role as Oschter Haws. Oschter Haws it was believed would actually lay a nest of magically colored eggs for all the good girls and boys. One is hesitant to think about what he left for bad children but chances are it would have been less preferable to the lumps of coal Santa would leave for such children. 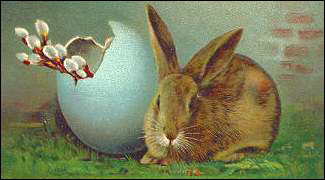 Eggs like the rabbit had long been seen as symbols of life and renewal. Servants were once given eggs as gifts from their masters on Easter during the Middle Ages. From this came the concept of the Easter Egg but it was not until the late 19th Century that the eggs and bunny would truly come together. German immigrants to the New World in the 1700s brought over their Oschter Haws tradition. Over time the Easter Bunny tradition was born and became firmly entrenched in American culture. Overall it should not come as much of a surprise that two completely non-Christian symbols such as the rabbit/hare and eggs have become so tightly woven into the Easter holiday. The Easter holiday itself represents a bit of early Catholic salesmanship to potential pagan converts. It was noted by Christian missionaries that many pagan cultures already celebrated spring fertility rituals around the same time as the remembrance of Christ’s resurrection. 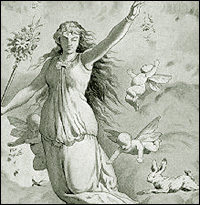 The word Easter, according to the the 8th Century English historian monk Bede, is derived from the pagan Anglo-Saxon goddess of Spring and fertility, Eostre. The hare is beleived to have been her sacred animal. Mythologically-speaking the resurrection of Christ, the Easter Bunny, and Easter eggs are very much the same in their symbolism. 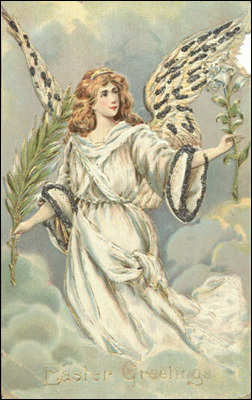 They all represent new life that comes with the Spring season so it was only natural that pagan converts would retain these images and mesh them with their new faith. Despite these symbolic similarities, however, some fundamentalist Christians see red every time that heathen bunny hops onto the scene each Easter with his hell-wrought basket of godless Easter eggs – the Easter Basket tradition actually comes from an old Catholic custom of blessing food in a basket on Easter but fundamentalists often don’t hold Catholicism terribly high either above paganism. While the St. Paul city council recently felt the Easter Bunny symbol too Christian, a few years back a fundamentalist sect in Pennsylvania was under no such illusion. They demonstrated their animosity towards this pagan interloper in a religious play. They whipped and beat a person dressed up as the Easter bunny and broke Easter eggs in a frenzy of Christian cleansing. Their purpose they claimed was to show that Easter is not about the Easter Bunny but about Jesus Christ. Needless to say many of the 3-6 year old audience members were a bit confused over the message the Glassport Assembly of God was trying to convey. The small young audience members simply wondered through their big bubbly bright tears why the Easter Bunny was getting the stuffing knocked out of him. With both situations, it’s a case of overreaction coupled with sheer foolishness. The Easter Bunny is a harmless entity much like Santa Claus. If it gives children joy and eases their suffering on Easter Sunday, then more power to the Easter Bunny.